That's my father with me in this lime green VW Bug. Recently, we had a blast taking the car, which belongs to Dad, on a long road trip. This, despite the fact that Dad bragged to everyone that he did not allow me behind the wheel even once during the 12 hour trip, fearing my limited sense of direction. But how would the trip have gone had dear old Dad been willing to let me drive? Find out here, as you assume my role and use your arrow keys to move the Bug from start (S) to finish (F). I've been trying to get through this puzzle all night, with no luck. I guess it goes to show you that father really does know best!  Pictures of our road trip from NY to NC! Click once within the lost highway to get your motor running, then use your arrows to move the Beetle. 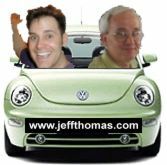 Click here to email the jeffthomas.com Father's Day greeting to your dad!